The Piaggione of Serravalle, at a first glance, appears as a gem naturally cast on the highest ridges of the Chianti hills of Central Tuscany, and as a jewel it shines with its authentic flavors, ancient traditions and silent stillness. 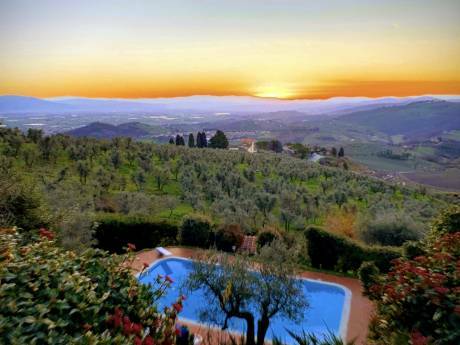 Shaded and enclosed by oak woods and shrouded by the greenness of its olive trees and vineyards, it mingles within the horizons of the grandeur of the Tuscan countryside that is still genuine and remarkably unspoilt. The structure of Piaggione consists of two spacious apartments, one holds four, the other, three bedrooms and a separate two bedroom cottage. Among these, the Loggia, which houses a wellness center embellished by an exotic touch. On the top floor a spa tub and an infrared sauna and, accessing via a staircase, you will approach a somewhat hidden room used for massages and turkish baths on the bottom floor. 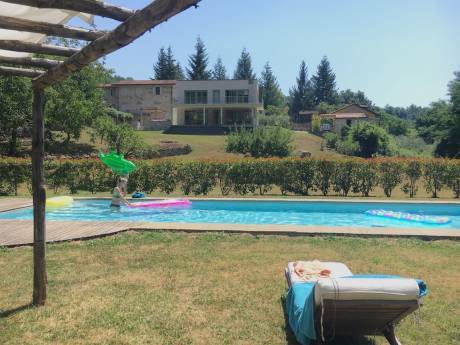 On the outside you are welcomed by a splendid swimming pool that plunges down on the lush valleys and, between sprouts of fragrant shrubs, built in the rocks, a jacuzzi tub that is surmounted by a spurt of hot water. Small paths and stone steps cut into the gardens that slope down the valley, designing silent hidden nooks that make its way through the forests. In this enchanting setting, stand out the modern sculptures of famed artist Alberto Inglesi that will accompany your quaint countryside strolls and hikes. If your desire is to rediscover the spontaneousness of life, the Piaggione of Serravalle is the place to be, to relax and immerse yourself in the magnificence of a Tuscan setting blessed by serenity and silence. The Piaggione of Serravalle is a unique farm. With an uninterrupted thirty year activity, in the chaos and hassle bussle of modern society, it proposes itself as an enlightened example of eco-compatibility that brings forth a devout respect for mother nature from which it draws its fortunes. We are talking about a working farm estate that is based on real life family stories and human relationships that are perfectly compatible with our times. One of our goals is to improve the excellence in the quality of services as well as being discreet in maintaining unchanged the authenticity of the ancient traditions of the area. 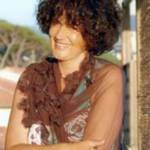 Camilla is a licensed tour guide that has been operating for over thirty in Siena and its province. Together with her husband Alberto, at her mothers death, despite the hard times, she decided to roll up her sleeves and take control of the project, proving not only to be fit for the task but demonstrating a strong character suitable for the role. She undertook challenging decisions, always dictated by a spirit of loving-kindness and far-sighted choices that rewarded her over the years and that culminated in this wonderful masterpiece. Camilla is fluent in English, French and German and her vast knowledge of local history and art of the area, together with her fascinating savoir faire, guarantee unforgettable tours and excursions to explore Siena and its treasures. Her passion for the authentic taste of local cuisine, is high-flown in her first-class preparation of typical dishes that she cooks and serves in unforgettable dinners accompanied by Chianti wines of her own production in front of somewhat a fairy tale landscape. Alberto is a world acclaimed sculptor. His works can be admired not only on the premises but can be found in many other permanent exhibits, as well as Milan, Rome and Turin, in the Canton of Fribourg or in the Castle of Gruyeres. He has been responsible for adorning squares and corners of many villages and museums scattered around Tuscany. His innate manual dexterity allowed him to implement the works of her brilliant wife that suggested him to embellish the property by leaving his own artistic signature a bit all over the estate. Alberto also embarked a journey of his own self discovery, that convinced him it was time to lead a life more in union with nature. You shall in fact always find him around the property, busy with his chores, that include all the daily activities necessary to run the farm and thanks to his kind nature is always willing to satisfy your requests. At the Piaggione you can enjoy the fruits of his wise and patient work, from wine to olive oil, to the eggs laid by his hens, his meats and all the other organic goodies he cultivates and produces, and of course, we highly recommend his speciality; the pizza he bakes in the ancient wood oven on the premises!